Palm Beach, FL Exit 70: Whom better to honor than your grandparents? There is a special bond that is shared between grandchildren and their grandparents. National Grandparents Day was declared in 1978 to be celebrated in the US on the first Sunday of September after Labor Day; It was signed into law by President Jimmy Carter. 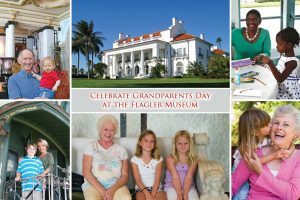 This entry was posted in Articulture, Arts and Crafts, Entertainment, Florida, Fun, History, Kids, Museum, Special Event and tagged activity, age, appreciation, celebration, collection, commemorate, estate, exhibit, family, family photo, family tree, family-friendly, Flagler, Flagler Museum, Florida, gilded, gilded age, grandchildren, grandfather, Grandparent, Grandparents Day, guided tour, Henry Flagler, History, honor, interview, love, Museum, Palm Beach, pavillion, photo, postcard, present, program, Railcar, retreat, role, scrapbook, tour, wedding, Whitehall. Bookmark the permalink.